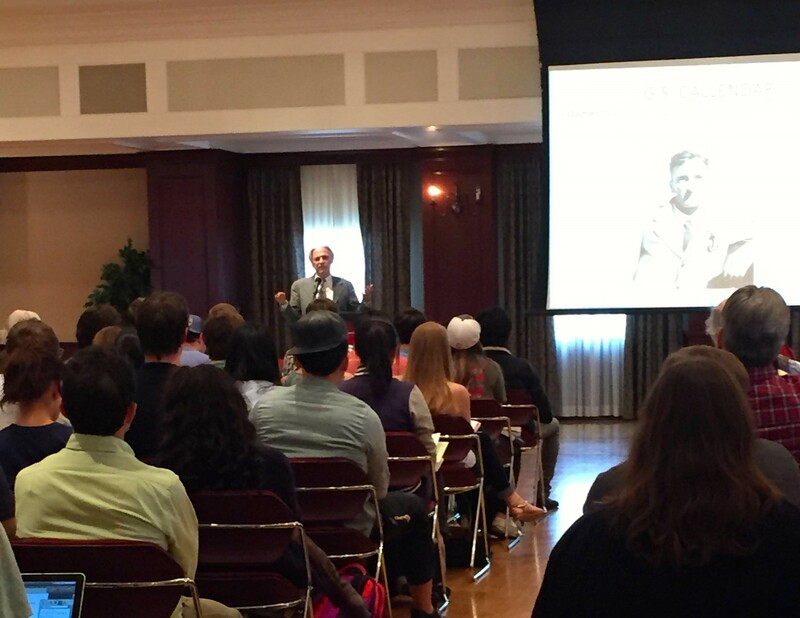 Dale Jamieson spoke in front of a full room of students and faculty Monday March 16 in the Shriver Center’s Heritage Room. “Why the Struggle to Stop Climate Change Failed and What It Means for Our Future” was the title of his lecture. Jamieson, a Professor of Environmental Studies and Philosophy at New York University, and an Affiliated Professor of Law and the Director of the Animal Studies Initiative, is certainly well qualified to speak on this matter. In addition to his impressive job title, Jamieson has authored several books and served as the editor or co-editor of nine. The lecture started with a comprehensive history of climate change and everything that has led up to where we stand today. The historical element of climate change led to the main point of the lecture: Why has the struggle to stop climate change failed? Despite the development of science, policy initiatives, and an active civil society, climate change is still a looming dark cloud that threatens our future. Jamieson started this section of his lecture with a bold statement. Even though most climate scientists would probably agree with this statement, nothing has really motivated humans to move rapidly enough to effectively combat climate change. Jamieson believes this is because evolution has built us to respond to “accessible, rapid movement of middle sized objects in our visual field” which, as he points out, climate change is not. In other words, imagine if greenhouse gas emissions had some sort of visually sickening appearance and we could actually see these emissions seeping into our atmosphere. We would probably be inclined to act quickly and curb the enormous amounts of greenhouse gases we add to the atmosphere every day. Gases, like carbon dioxide and methane, are invisible to us and thus easy to ignore. In addition, climate change is caused by the everyday, routine actions that make our lives comfortable. It is hard for us to see the cause and effect between flying, driving, heating and cooling our houses, and even our dietary choices and the destruction of our planet. This is part of the problem and a crucial part of Jamieson’s lecture: innocent acts contribute to climate change. It was at this point that Jamieson shared a quote by John Nolt. It contained an incredibly sobering statistic that left the whole room silent. The problem is, we don’t feel like ruthless killers every time we get in the car to go somewhere. It is hard to wrap our brains around the fact that the things we have that allow us to live “the good life,” as Jamieson puts it, are really contributing to the destruction of our planet and the suffering of future populations. Jamieson went on to discuss part two of why we struggle to stop climate change, which comes down to a matter of public ethics. He believes that climate change denial is much like past issues of DDT, acid rain, asbestos, and tobacco. Big tobacco companies denied any link existing between smoking cigarettes and cancer because it allowed them to stretch out their legal battles for as long as possible. By casting doubt they were able to stretch out their profits. Some believe climate change denial should be considered a crime. Jamieson, however, does not think denying climate change should even be thought of as lying because it is a reflection of a more generalized cultural problem. For example, we do not even expect politicians to tell the truth anymore. We expect that most people are more interested in keeping the companies they are affiliated with profitable, than with speaking the truth. So the solution to our lacking efforts in actively combating climate change is to change our society from one that is “truth challenged” to one that values truth. It seems if we could really make truth a priority, climate change would not be the only problem we would be more readily prepared to tackle.